Adalyn Has a Secret to Share!! Adalyn has something that she wants to tell everyone!!!!!! Baby Hernandez 2.0 coming April 2017!! This has been a hard secret not tobshare and I am so excited to tell everyone. 11 weeks- showing SO much quicker than last time! -How did I find out? My period was a day late so I took a test. I thought that it would be negative but, well, it wasn't! -Who did I tell first? I had to keep tradition the same and tell my dog Jaxen first!! Then, I told Adalyn and then, of course, I told Troy. -How did I tell Troy? It was such an odd morning that I found out that I was pregnant and I think it was so meant to be. It was the morning of the funeral of a loved one when I found out. It was such as sad day but such a positive spin. Troy had just made his coffee and was standing in the kitchen. I said to him "I know it is a sad day but I have something to make it better". I said "I'm pregnant!!". He put down his coffee so quick and started screaming and jumping up and down and hugging me. He was so excited. -How did we tell our families? With these awesome shirts that I got from Etsy pictured in these photos. Everyone was so, so happy for us! Troy's grandma was screaming she was so excited which is not something that she does often and it was super memorable. My brother took a solid 20 minutes to notice the shirt. Most people noticed it right away and was very happy for us. Adalyn now knows what her "sister shirts" are and asks to wear them. Yes and no, I believe. She knows to say that she is going to be a sister. She knows to say that the baby is in mommy's belly. She kisses and hugs my tummy which is insanely adorable. I don't know that she fully understands what is coming though. -Do we think it is a boy or girl? Troy, my mom and I feel like it is a boy. Honestly, I don't care either way. It would be awesome to have another girl but it would be cool to have a boy too. Just praying for a healthy baby! Overall, so much better than with Adalyn! With Adalyn, I never vomited or anything but had bad nausea for 3 weeks straight. This time, I have had nearly zero nausea. It is amazing. I have definitely had food aversions and have had foods that I do not want such as feta cheese, coffee and vegetables which are things that I typically love. I do feel a lot more tired though which is to be expected because I have a toddler to chase around even when I am tired. Also, the blog has provided me with so many opportunities now than when I was pregnant before that keeps me super busy. I've taken about 5 naps which is so not like me so I know that I've needed the rest. I am not sleeping well some nights- I toss and turn and my huge pregnancy pillow made its way back into our bed at 7 weeks. I get up once a night to pee right now. I have definitely been bloated. It is so funny because my stomach is nearly flat in the morning and gets so much bigger by the evening. I am eating so much! I am constantly hungry. It is funny because with Adalyn, I was sad that I did not have a lot of pregnancy cravings. This time has been totally different. I have so many foods that I HAVE TO have! Some examples are beef barley soup, quesadillas, eggs, spaghettios, pizza, any kind of potato, especially mashed, etc., etc. It is so funny to see what I am craving. Once I get a craving in my head, it doesn't go away until I eat it. It can be hard to eat healthy at times right now but it is getting better and I eat my veggies when I can. I try to eat what sounds good while taking my prenatal vitamins and omega 3. -How far along am I? I will be 12 weeks on Monday. We have a few boy names and a few girl names in mind but nothing is set for sure yet. I am so indecisive with this because it is such a big decision. -Will I be writing about the pregnancy? Somewhat. I am not going to be doing a weekly journal but am going to write about pregnancy nutrition, pregnancy must-haves, maternity clothes and stuff like that a bit. I will probably check in every so often with belly pictures and updates. Thanks for hanging in there with me and I am excited to share my journey with you of expanding our little family! Woo hoo! Can't wait to be a big sister. Thanks to Bump and Beyond Designs, Feeling Printy, Unordinary Toddler and Tugboats and Tutus for the beautiful shirts that we will always treasure! I literally was just wondering about you the other day...YAY!!!! 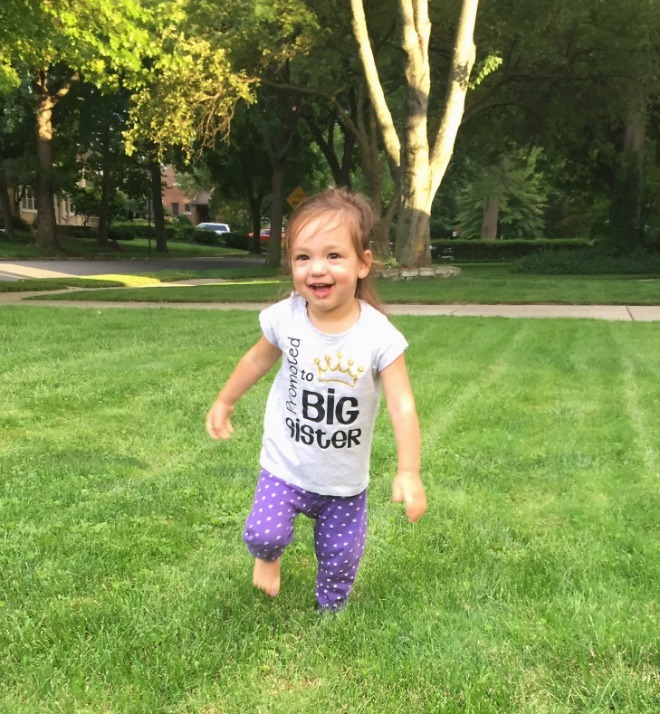 Adalyn is going to be an awesome big sis :) Congrats, girl -- love watching your cute family grow! I'm amazed at how much she's grown and now she's a big sister!! congratulations to the entire family!! When you said a couple of weeks ago on IG that you had some news, I was hoping this is what it was! That was it!! I didn't realize that everyone would know what I was talking about. I was just excited and wanted to give a hint haha. Thank you! Thank you! She loves them so much. Congrats to you and your husband and to your presious Adalyn..She is going to love being a big sister..
That's so exciting that you found out on what would have typically have been a very sad day. For my little girl, I was still showing negative on the pregnancy test 6 days after my missed period. I didn't test again until 18 days past my missed period and obviously I got a positive result finally. I'm going to say GIRL again because you aren't having much nausea. From my experience of being pregnant with boy genders, boys cause you to be so much sicker! Thank you! For my first pregnancy, the test kept coming up negative also. That's crazy it took 18 days after to find out! This time, I found out right at 4 weeks. Wonderful news, Amanda. Congrats to you and your family! I love the shirts you purchased for Adalyn. She'll be a great sister, you and Troy have done a great job with her! Congratulations! I'm glad you are feeling good. I love Adalyn's shirts. I've been following your blog since before she was born, and look forward to reading about her becoming a big sister! Aww thank you for reading! Thanks! Congrats! I wish you and baby all the best. Those big sister shirts are adorable. Congrats! Love the cute shirts. Your daughter is getting so big. Btw, my little brother's birthday is April 3rd. That is so sweet Heather! You have been reading for a long time. I appreciate it. Thank you! Congratulations and best wishes to all of you! These photos are wonderful too!